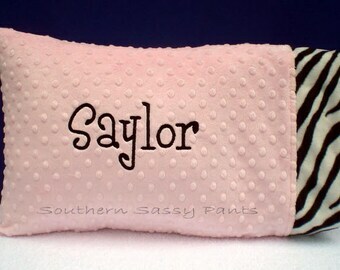 This listing is for a super soft and cuddly minky pillowcase. It is for use with a 12" x 16" pillow insert, which IS included in this listing. 5. Embroidery placement: on the main part of the pillowcase, or on the contrasting band. 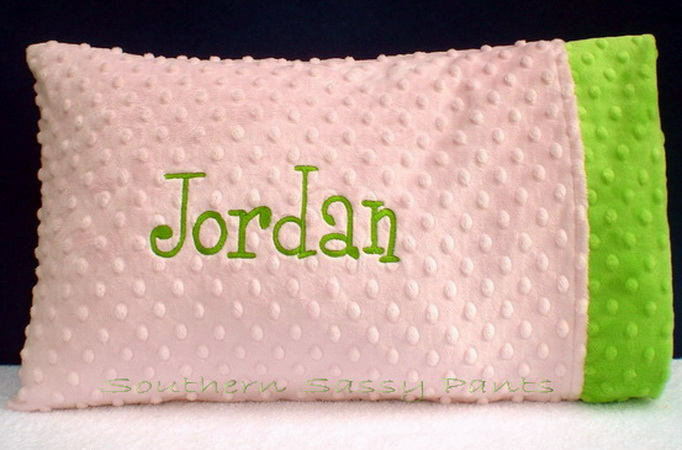 All of Southern Sassy Pants' items are carefully hand crafted in a smoke-free home, using only the finest materials available, with close attention being paid to every detail. I guarantee you will not be disappointed! Please check my homepage for additional information (including my current turnaround time) about placing an order for this item. The American Academy of Pediatrics recommends that soft objects such as pillows, quilts, comforters, stuffed toys and other soft items should be kept out of an infant's sleeping environment. ~Minky pillows ship via Priority Mail in the U.S.